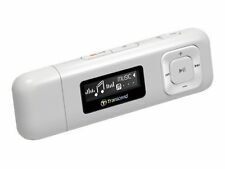 8GB Transcend MP710 Digital Music Player w FM Radio, G-Sensor Step Counter White. Condition is New. Shipped with USPS First Class Package. 8GB Transcend MP350 digital music player with lots of built-in features such as FM radio, voice recorder, Fitness Tracker, Smart Recording and much more. Plays all popular file formats such as MP3, WMA, WAV. Stylish black/blue edition. Supports MP3, WMA and WAV files. 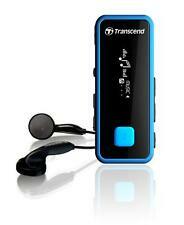 Transcend MP710 MP3 Digital Music Player with built-in G-Sensor Step Counter. Lots of advanced features like FM radio recording function, voice recorder, earphones with earhooks, line-in recording and much more. Great fitness companion, crystal white edition. Transcend T.sonic 610 White ( 512 MB ) Digital Media Player. Operational Condition : Item Is Used And Tested Good Working. ● sport clip that is attached pocket and clothes, a bag. ● I corresponds to the music files of MP3, WMA Digital Music Player MP350 multi-function. ● display and clear organic EL display white text display. If you need a stylish value-added music player for all occasions, look no further than the MP330. Transcend Digital Music Player 8GB MP-330 (Pink). 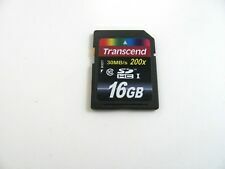 Capacity and 8GB. From TV animation ONE PIECE WCF. Music Formats MP3, WMA, WAV (IMA_ADPCM) Recording Format IMA_ADPCM (WAV). Lead a healthy lifestyle with the MP350. The MP350 digital music player features a sleek, durable, and water-resistant outer shell that not only looks good but also lets you listen outdoors in all weather conditions. Hope to have an opportunity to serve you. If you need a stylish value-added music player for all occasions, look no further than the MP330. Featuring the Line-in function and a line-in cable, the MP330 enables you to directly record all the audio information to the music player while listening to video turtorials. 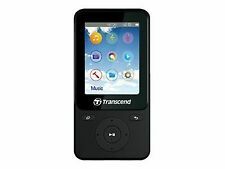 TRANSCEND MP300 TS8GMP300K MP3 Player. 8 Gigabyte storage. I will include a new unused pair of earphones as the original are used. The MP710 features a voice recorder, line-in recording, built-in FM radio, and schedulable FM radio recording function that holds up to 35 hours of audio with 28 hours of battery life. With excellent sound quality, the MP710 can also act as a USB flash drive with 8GB in storage space, enough for up to 2,000 songs or countless e-books and text files. In very good condition! Type: Flash. Battery 🔋 type : rechargeable Not included others accessories! WORLDWIDE SHIPPING WITH TRACKING NUMBER! Product details MPN: TS8GMP710K. Neben der normalen Musikwiedergabe kann der MP710 mit einer Akkuladung auch bis zu 28 Stunden Audiomaterial von drei verschiedenen Quellen aufzeichnen: FM Radio, Line-in und über ein integriertes Mikrofon. Bland : Transcend. Japan Usage Item. Expedite : EMS. 8GB Transcend MP330 digital music player with lots of built-in functions such as FM radio, voice recorder, flash drive, line-in recording and much more. Plays all popular file formats such as MP3, WMA, WAV. White edition, includes sports clip, cables and other accessories. Transcend MP350 8GB MP3 Music Player Fitness Tracker Japan new. 5 out of 5 stars - Transcend MP350 8GB MP3 Music Player Fitness Tracker Japan new. 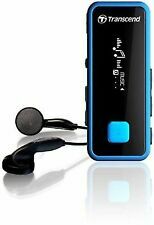 9 product ratings9 product ratings - Transcend MP350 8GB MP3 Music Player Fitness Tracker Japan new. Microsoft Windows Vista. Microsoft Windows XP. Microsoft Windows 2000. Line-in RecordingYes. Weight25g (0.88 oz). Recording FormatIMA_ADPCM (WAV). WarrantyTwo-year Limited. S/N Ratio≥= 90dB. New Transcend TS8 GMP 350 B [D. Transcend Japan. igital audio player 8 GB] F/S. from Japan. Initial failure warranty. All wink warranty repairs are carried out by the manufactures here is Japan. Specifications and appearance of the product might be different from the image due to the timing of the date of manufacture / dispatch.